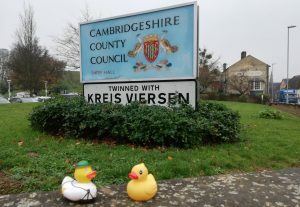 Cambridgeshire County Council met on Tuesday to set its budget and council tax. The conduct of the meeting was deeply embarrassing and it’s just as well that the live video stream wasn’t working. • Revenue grants to local government from central government have been decreasing over the last few years and have now dropped to zero for Cambridgeshire. • The government sets a limit on the amount by which local taxation (Council Tax) can be increased without there having to be a referendum. The pre-determined limits this year are 2% for Adult Social Services and 2.99% for all other services. To maintain last year’s level of expenditure on services would have required a council tax increase of 14%. So, the debate was about how to make the savings, for example by reducing/eliminating the service, or by providing a similar service more economically. Increasing income (for example by selling off CCC assets) and reducing administrative costs are also considered. For example, moving CCC HQ from Cambridge to being a ‘hub’ in Alconbury Weald and making greater use of existing council buildings as ‘satellites’ is in the pipeline. The outcome of four hours of rather tetchy debate was that the ruling group’s (Conservative) proposal for a tax increase of 2% + 2.99%, 4.99% in total was voted through, together with a range of service reduction measures amounting to a total of £27.354 million compared with the previous year. To give you an overview idea of the net revenue expenditure (i.e. after grants, fees and other income is accounted for), CCC needs to find £319 million, of which the two main expenditure areas are ‘People and Communities’ (e.g. adults and children’s social care) £254 m and Place and Economy (Highways, Environment, waste disposal, libraries, concessionary fares) £58 m.
The opposition groups (Lib Dem and Labour) put forward amendments. In summary, Labour wanted to use up more of the reserves to support Children and Young People, more health visitors, more funding for libraries, better street lighting, and a total tax increase of 3.99% rather than 4.99%. (NB Councils are required to keep a specified level of reserves). Lib Dems supported the higher tax increase of 4.99%, proposed reductions in payments to councillors, reduction in administrative costs (fewer committees), removal of wage cut for employees, better youth services, protection of services to the most vulnerable young people. In the years 2014-2017, the Conservatives, under pressure from UKIP, did not fully utilise the council tax flexibility. Had they done so, the council tax base would have risen and this year’s increase would have brought in an extra £11m. The cost to a Band D household of every 1% increase is 23p per week. The 4.99% increase will cost £1.15 per week. Over 60% of households in Cambridgeshire are in the lower bands A-C.
Central government has made some minor increases in what it allocates to local government and a new distribution formula is promised now that ‘austerity is over’.